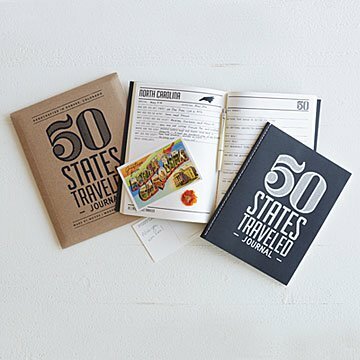 Chronicle your 50-state travels with Taylor and Tanner Palmie's thoughtfully designed journal. What was that cozy cafe in Vermont? Or that offbeat museum in Missouri? Don't rely on your memory or random notes on napkinschronicle your travels through the 50 states with Taylor and Tanner Barkin's thoughtfully designed journal. From Alabama to Wyoming, each state gets two pages of prompts to help commemorate your journey, including spots for the cities you visited, best meals, funniest moments, and even an ironic invitation to jot down "anything that would be better forgotten" (like that detour to see the world's largest ball of twine). The uncluttered pages and portable design make it a welcoming companion for any avid traveler. Handmade in Colorado, the great state waiting on pages 16 and 17. With their canine studio mate, Scout Barkin, husband-and-wife team Taylor and Tanner Barkin make endearing graphic designs in their Denver workshop. All their work starts with Taylor's hand-drawn sketches, reproduced in small runs as screen printed t-shirts, prints, and books. This design duo enjoys a unique bond. "A few years after we began dating," says Tanner, "we started to see how our interests were so vastly different from one another, yet we worked so well together and developed a strong passion for the business we set out to create." She adds that they collaborate well because they "never settle with one another's ideas, but rather push one another to keep improving." I received the 50 states book as a gift. I must admit it was one of the best gifts I've ever received! So glad I bought two! Now that I've seen it, I need more! Great to fill with memories and mementos of special times! To track travels and make sure some of the business travel is also for pleasure! Great way to preserve memories and rehash for years to come. With older kids, we let them write in things. It can very interesting to see what they remembered that parents didnt notice, like finding out the kids ordered a couple hundred dollars of ice cream through the week at the resort we were at before we found out! Things from their perspective are so different from an adult. Journaling those thoughts is what knits families together! Would be good if you would show an actual page in your presentation so customers know what kind of questions are in the book before buying. And also a binding that allows the book to lay flat for easier writing. This is a gift, but I know I'll be recording travel highlights as well as my husband. Perfect for anyone who loves to travel! My brother is a traveling medical tech. He loves to travel and I thought this would be a perfect Christmas gift for him to log all the places he goes! I haven't given it to him yet but was very impressed in the quality of this book and I know he will love it!